They have the most bonkers mini-golf course ever! It has no predetermined course just a set of starting points and holes – each group decides its own combinations. Amidst the chaos, I somehow managed to beat my golf-mad dad! Back to Haltwhistle station and then I walked through the streets of the town which claims to be at the centre of Britain; if the centre is the midpoint of the longest north–south meridian and includes the Orkneys, but not Shetland Isles. Other methods are available: https://en.m.wikipedia.org/wiki/Centre_points_of_the_United_Kingdom. 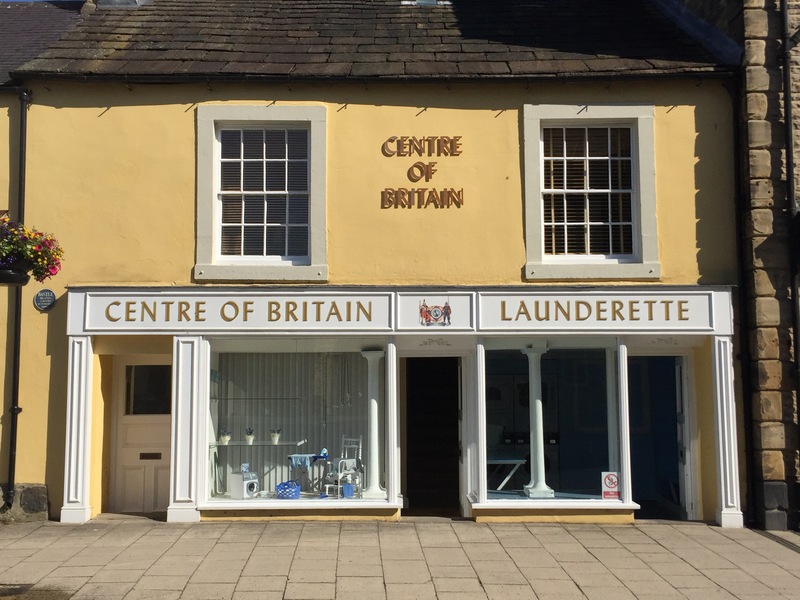 Centre of Britain Launderette – really?! Out of the town the path rose through fields and across a road to reach Hadrian’s Wall. We had devised a complex schedule which allowed each of my parents to walk a section of the wall without doubling back to get the car or tend to their very old dog who practically lives in the boot – out of choice – whilst on holiday. So firstly I picked up my mum and we walked up and down and up until we reached Green Slack where the views were extensive. We dropped back down to a car park to do a relay-esque swap with my dad. 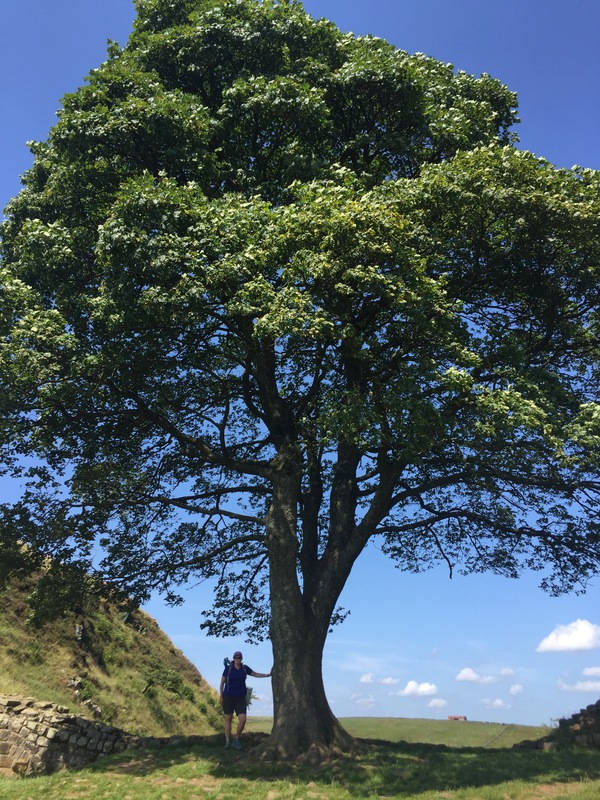 We then went up and by Peel Crags and saw Sycamore Gap. At the next junction I turned north to continue along the Pennine Way and my dad dropped off to the south to meet my mum at the pick up point. The rest of the day was moor and then my first experience of large sections of forest where it was surprisingly boggy underfoot. I thought that the vast swathes of trees would soak up every molecule of water, but alas it appears there is just too much water in these parts and so I got very wet feet having opted for trainers – mainly just because I could! As I was reaching the point where I had agreed to meet my dad I looked at my watch and saw that I was 5mins early, that’s pretty good timing I thought and it’s no time at all to wait. I continued down the path approaching the lane when the car appeared and just as I climbed over the stile my dad arrived alongside it, so I opened the door and leapt in – A-Team style! We were gobsmacked by the perfection. It was extraordinary that we arrived at the exact same spot at the exact same time. Tonight was my parents’ last night and mine with the extra home comforts – we played cards and had some brandy. 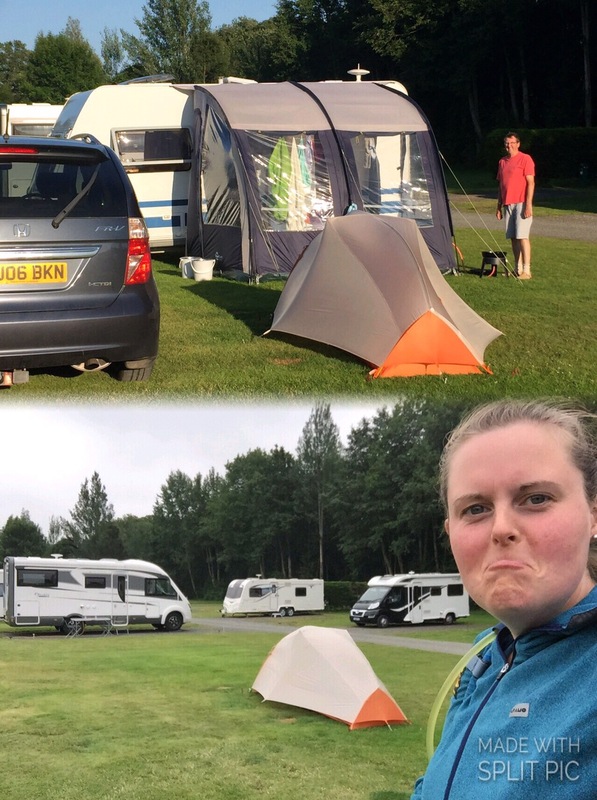 I’d arranged to stay an extra night at the campsite sans caravan so all I had to do after being dropped off was walk the 7miles back to the campsite. It was a slightly teary goodbye and I waved my parents off down the lane. Farewell comfy pillow, goodbye clean non-hiking clothes, cheerio well rounded meals and packed lunches, au revoir Dusty (the dog) oh yeah and ciao mum and dad! It was a fairly uninteresting 7miles but I did find a ‘Pit Stop’ for Pennine Way walkers. Little signs and arrows pointed you in the direction of a former stable building that had been transformed into a hikers haven/treasure trove. 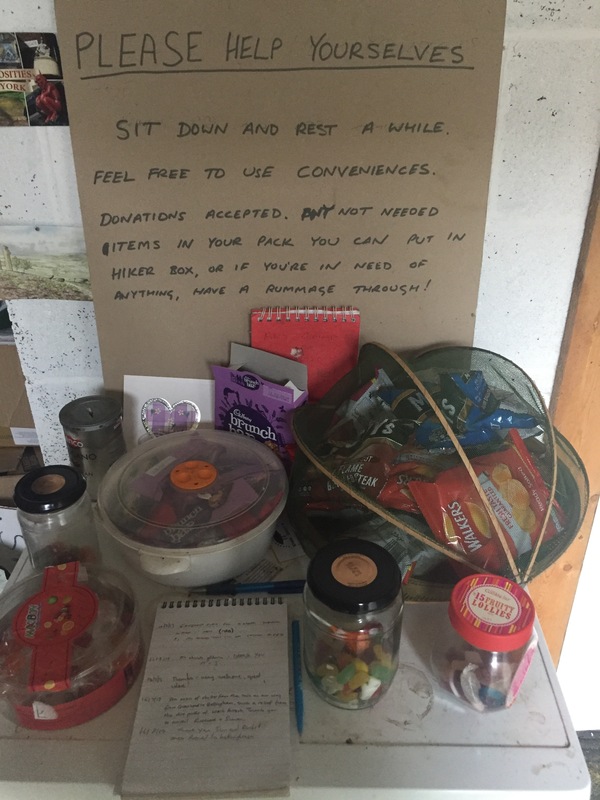 It had seats, snacks, drinks in the fridge, a kettle plus accoutrements, toilet and shower, washing machine and tumble dryer (these may have just been the owners’), oh and a little box of hiker goodies – a spare guidebook, plasters etc. As it happened I didn’t really need anything, but I could have done with something similar many a time. Such generosity from the owner to let hikers hang out in their barn – love it. It got me thinking; why haven’t I seen more hospitality based on honesty? Perhaps it’s just too much effort. The other small piece of drama was coming across an injured sheep. It had a wound on its back leg that had attracted flies and it wouldn’t walk – it just stood there no matter how close I got, I could even stroke it. I took a note of the number on its ear tag and reported it to the next house I came to. Hopefully the girl I spoke to managed to find the farmer and it’s been looked after. Got back to the campsite in time for lunch and spent the rest of the day chilling out in the campers lounge and getting myself ready to head off again. After setting off from Bellingham, heading through a farmyard, getting chased down by a dog and hitting the moors again, I found a number of other Pennine walkers. There was a South African lady who’d walked from Chepstow for charity and was joined by a friend, Greg an Australian chap who likes coming to the UK to do the long distance trails and a group of 3 more Australians (father and 2 sons). Nothing much else happened so here is a picture of a sheep with massive horns. 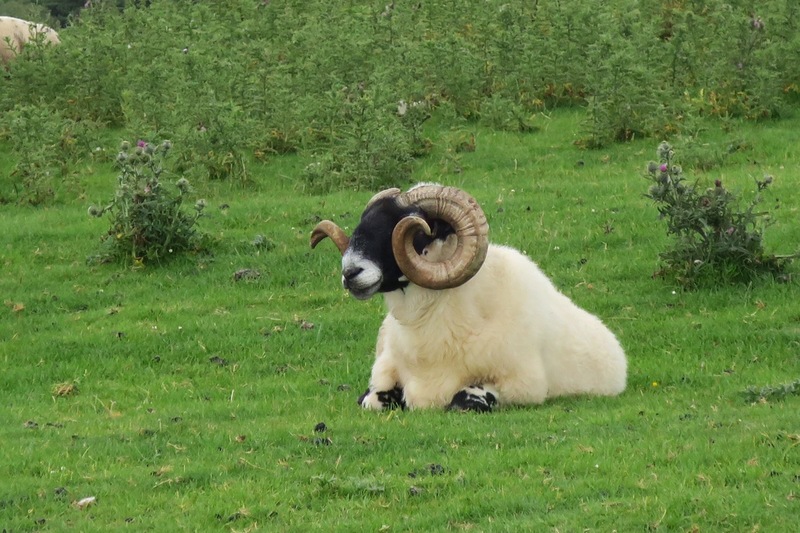 I’ve seen A LOT of sheep since Land’s End – tens of thousands – and this one has the biggest horns by far. At around lunch time I met Claire another Pennine wayfarer. Then it was a long trudge down a forest road which I hated. 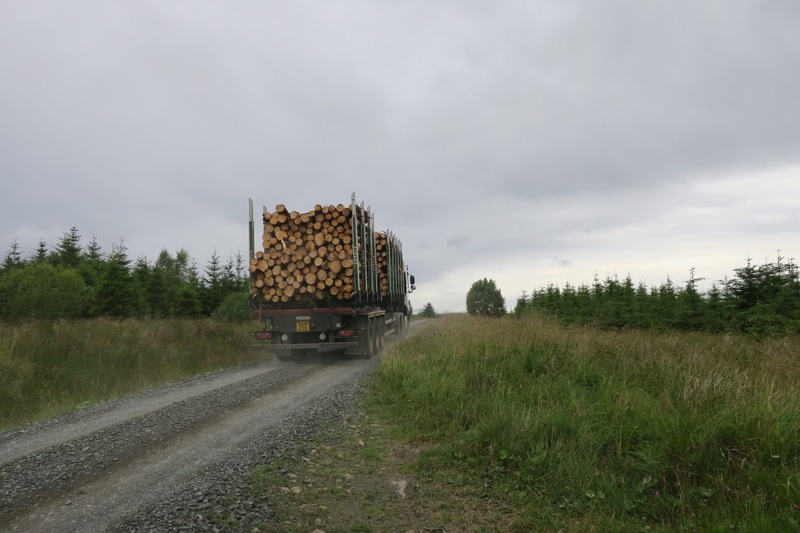 There were a few lorries that barrelled along them too – without slowing – which was lovely of them. I kept myself going until I reached the edge of the forest where there were picnic benches. I was going to treat myself to a long sit down, boots off ‘n’ all. But as soon as I sat down the midges attacked. They put a very quick end to my plans and so I picked up my heavy bag and carried on grumpily. I could definitely feel the full weight being back on my back. My destination was the Forest View Walkers Inn and I’d arranged to camp in the back garden for free provided I bought a 2 course dinner and had breakfast. At £22 it was a good deal as there weren’t any shops or restaurants in Byrness. It was here that I’d meet everyone that I’d seen on the trail today plus a few others who were staying a second night. 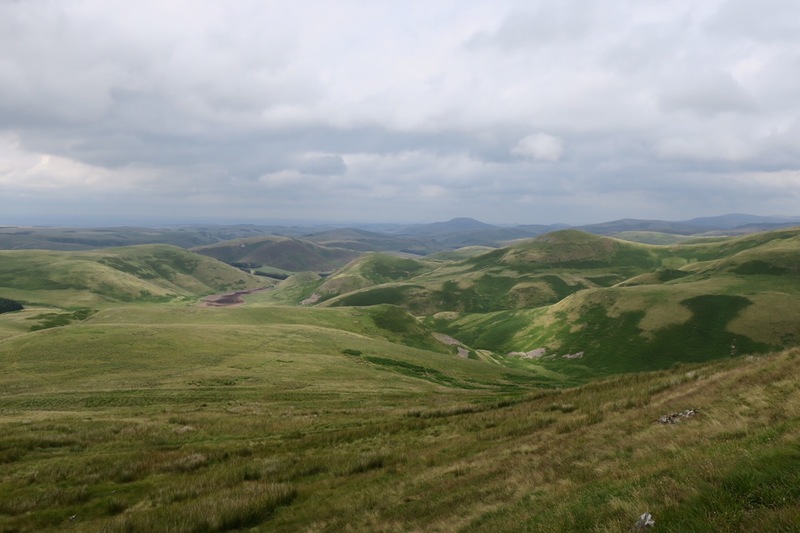 (The last day of the Pennine Way is 28miles which is too far for most people so Joyce and Colin have a minibus to pick walkers up halfway to Kirk Yetholm at the end of day 1 and then drop them back the next morning.) One of those with just 1 day left was Dom who I’d met on day 50 (over 2 weeks ago) – how we’d not crossed paths in the interim I have no idea. (Hi Dom if you’re reading! Hope you enjoyed you’re free half pint in KY!) The inn was fantastically sociable with everyone sharing experiences and comparing notes, plus spirits were high as everyone had only 1 or 2 days left. The hand pumps in the corner of the living room helped! As did Colin’s many tales of walkers he’d seen pass through his doors. Just another note on the Walkers Inn – not only were Joyce and Colin lovely and interesting hosts, the food was great, the beer was good, and everything was clean and tidy. But here’s the clincher – the drying room! Not only did it work but when each walker arrived Colin would take your boots from you, take out the insoles and number with chalk both the boots and the insoles. He’d then prioritise the wettest boots and rotate them around the rack accordingly. In the morning, once they were all dry, they were paired up and brought into the conservatory for everyone to slip on…now that’s service! 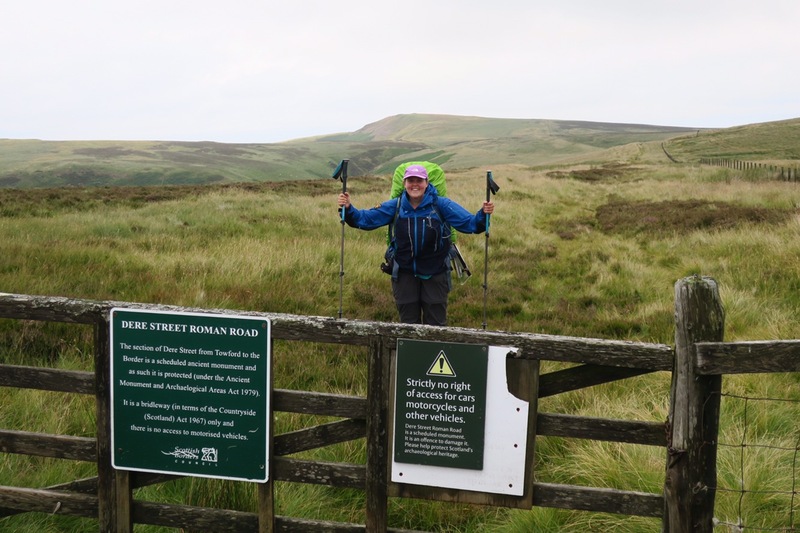 Last day on the Pennine Way – I had to make a note on my map of where to turn off so I didn’t end up going towards Kirk Yetholm. I set off with Greg straight up Byrness Hill which is a steep and slippery muddy bank. Once atop the moors we met a few more walkers and we eventually caught up with Claire. 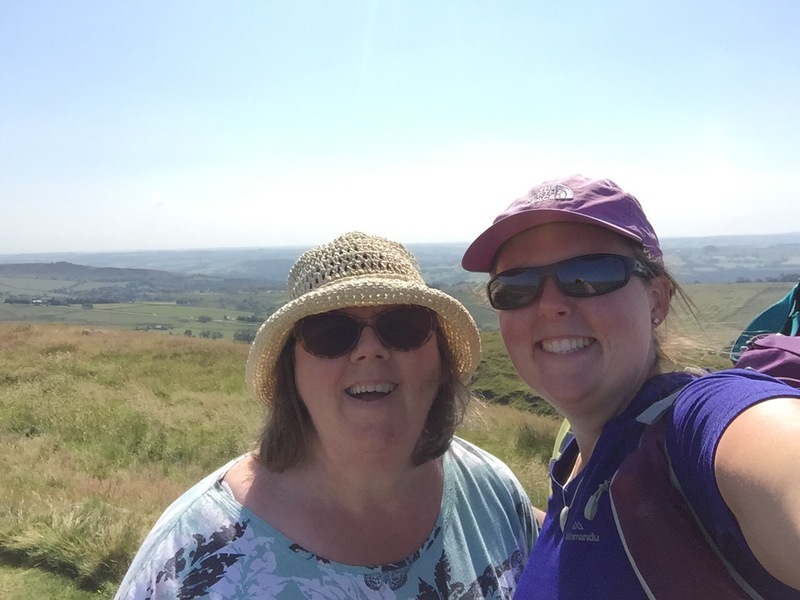 We passed by Chew Green – a significant Roman Fort complex – and not long after I turned left off the Pennine Way and across the border into Scotland! I’ve walked to Scotland – yay! I waved goodbye to my companions and on my own again I got a little bit emotional; “little ol’ me has walked 750+miles across the length of her own country”. I had lunch at the top of Blackhall Hill staring into the land of haggis, whiskey, tartan and Mel Gibson in a kilt. As I descended I looked around and the landscape definitely seemed different. There were lots of interesting lumps, bumps and humps and I was philosophising over whether I thought it was different because I knew it was a different country or whether if I’d been ignorant to the border would I notice a change? Either way I could definitely sense a change, even if it was just mentally and emotionally. I was now walking along Dere Street which is a Roman road built well before Hadrian built his wall. It runs from York to Edinburgh and I’d be walking it for the rest of the day until I found a wild camping spot. 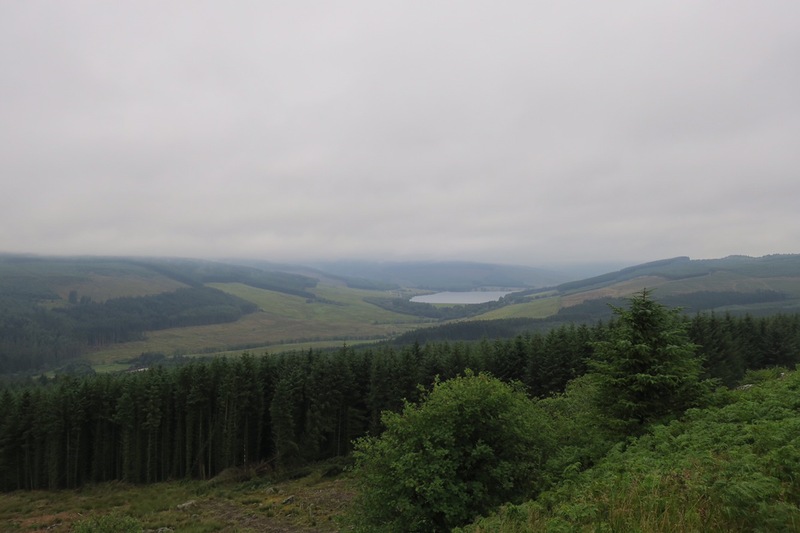 The border did signify a game changer – I could now legally wild camp almost anywhere, which makes the planning a bit easier. No campsites? No worries, just stock up on food, refill water from a stream and I’m good to go wild camping anywhere. I had my eye on a particular hill and getting closer I started looking for spots. When Dere Street met a lane there was a bench on a flat-ish area of grass. Looking ahead, the hill I’d seen on the map was nothing like reality. The area of woodland had been felled, the walls/fences had been removed and it was littered with cows and sheep. The area by the bench would be more than sufficient so I stopped there and then. It was only 5pm so I didn’t pitch up, instead I wrote my diary, did some stretching and sat upon my bench. The lane was very quiet, only 1 or 2 cars an hour or so, that was until no less than five 4x4s came screeching to a halt right alongside me and turned my tranquil spot into a car park. Well I was fuming, “who the bloody hell are this lot and what do they think they’re doing just parking all over my abode?” Then Tony Robinson got out, and all was forgiven! 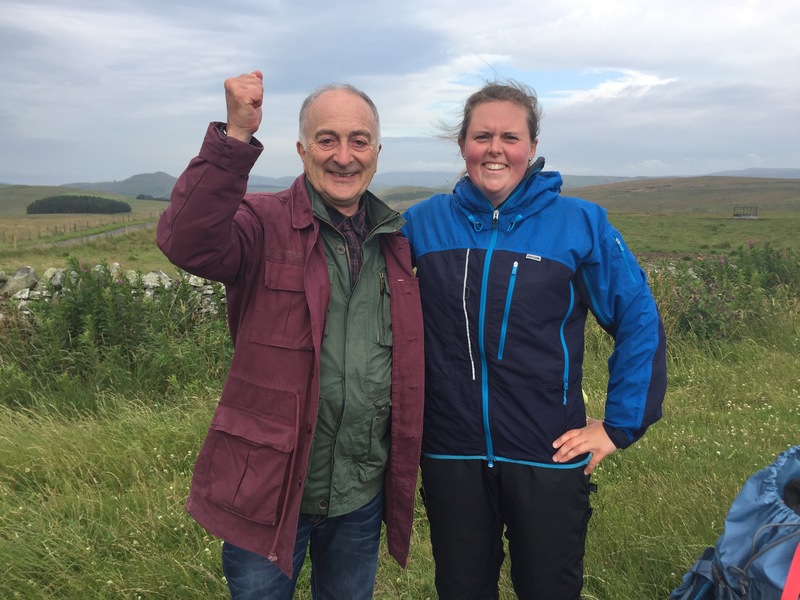 He was with a TV crew and they’d arrived to do some filming on Dere Street for a series called Ancient Tracks. Once he’d heard about what I was doing there, he came over, shook my hand, congratulated me and posed for a photo. I spent a good hour or so talking to various members of the crew (who gave me 2 bottles of water and a banana) and before I knew it they were gone again. What a surreal moment! It was only later on that I found out he’s Sir Anthony and I’d never met a knight before. It was probably a good thing I didn’t know beforehand because I wasn’t able to string a sentence together anyway, let alone come up with some quip about a cunning plan. So had I known I might’ve panic curtsied or something! 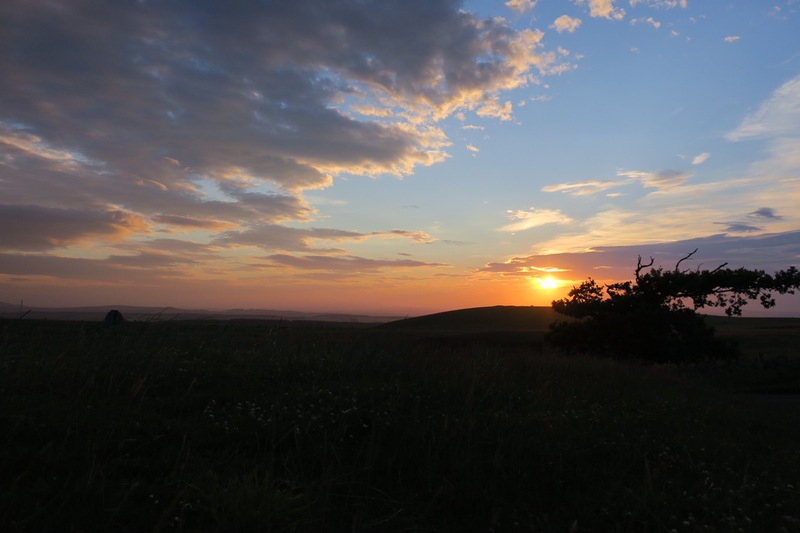 Once they’d gone I cooked my dinner, sat on my bench to watch the sunset and reflected upon an event filled day. Keep going Lucy and keep writing…. my hat is metaphorically tipped to you every time I dip into your adventures. Amazing how many places you visited I know as well… I have had Sunday lunch in Strines Inn a few times for example when I lived in South Yorkshire. Good luck on the rest of the route.